Over 800 guests attended the 2017 Tennessee Prayer Breakfast from across the state, representing government, business, education, and churches. 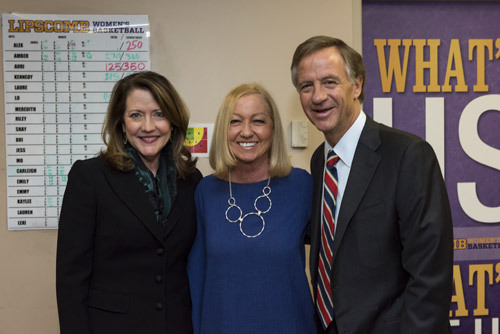 Mercy Multiplied Founder and President, Nancy Alcorn, joined Tennessee Governor Bill Haslam on the platform along with several other distinguished guests at the 43rd Annual Tennessee Prayer Breakfast held Tuesday, March 14th at Lipscomb University’s Allen Arena. 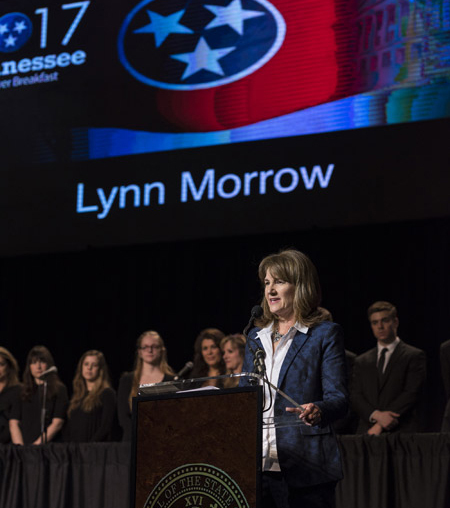 The annual event is held each spring in Nashville prior to the conclusion of the Tennessee General Assembly’s legislative session to offer focused prayer for God’s grace on the State of Tennessee, its elected officials, and its citizens. 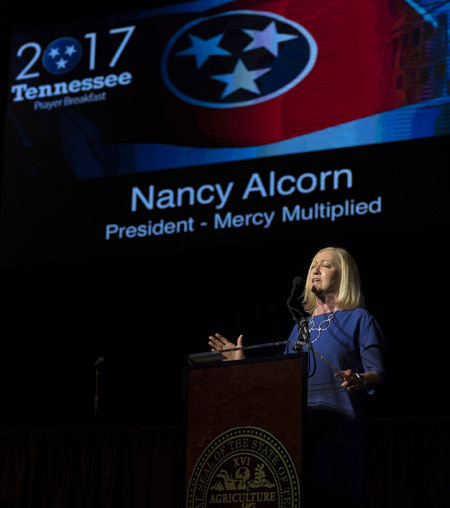 Alcorn offered the first designated prayer of the morning, leading the arena of over 800 people in a powerful “Prayer for the Struggling.” She prayed specifically for those who were discouraged all over the state of Tennessee, asking God to lift and encourage them in their current circumstances. The program also included “Prayer for Education” by Dr. Shawn Joseph, Director of Metro Nashville Public Schools; “Prayer for Unity” by Pastor Aaron Johnson, Founder of Intersync, and Steve Anderson, Metro Nashville Chief of Police; and “Prayer for Government” by Pastor Phil Covert, Fellowship Bible Nashville. The Prayer Breakfast culminated in Governor Haslam leading a special conversation with highly acclaimed singer-songwriters Chris Tomlin, Matthew West, and Tom Douglas. Each artist sang two notable songs from his award-winning repertoire and shared the inspiration that compelled each song’s writing. To conclude the program, all three artists, accompanied by The Nashville Choir, led the grand assembly in a musical benediction of How Great is Our God. Historical accounts trace The Tennessee Prayer Breakfast back at least 50 years when the event was actually hosted by Tennessee’s sitting governor. In 1980, an ad hoc Citizens’ Committee, led by Nashville entrepreneur and former ambassador to France Joe M. Rodgers, organized the Tennessee Prayer Breakfast in its present format, which is Tennessee’s version of the National Prayer Breakfast. Lynn Morrow, 2008 and 2017 Citizens’ Committee Chair, gave opening and closing remarks. The Citizens’ Committee, a volunteer group of Christian business leaders, elected officials, and ministry leaders, now presents the Prayer Breakfast annually. Citizens’ Committee 2008 and 2017 Chair, Lynn Morrow, directed this year’s program. Her leadership incidentally also extends to Mercy Multiplied’s Board of Directors, of which she’s been a member since 2009. Past Tennessee Prayer Breakfast speakers in recent years have included the Honorable Bill Haslam and First Lady Crissy Haslam, Richard Stearns, Michael W. Smith, Tom Landry, Charles Colson, Elizabeth Dole, Charles Swindoll, Franklin Graham, Anne Graham Lotz, and Scott Hamilton. Guest performers have included Mandisa, Melinda Doolittle, Amy Grant, Michael W. Smith, Allison Krauss, CeCe Winans, Larnelle Harris, Josh Turner, the Fisk Jubilee Singers, the Gaither Vocal Band and the Nashville Choir.